Feel free to contact me any time!!! It's never too early or too late! 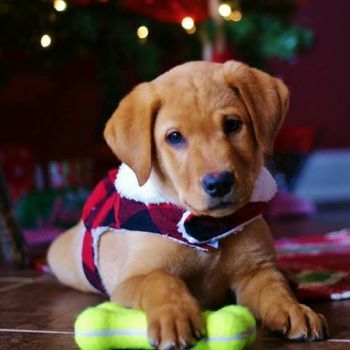 At Enid Labradors, we breed what we feel are the best looking Labrador Retrievers around!!! Look is only part of it however. Health testing is extremely important. Most of my girls are hip, elbow, eye, and heart tested. All are tested for Eic, Cnm, Pra + several more genetic diseases common to the Labrador Retriever breed. Breeding absolutely gorgeous and heath tested black, chocolate, and yellow (from snow white to extremely dark red)is what we do here. I breed show labs (English), field labs (American), and British field trial labs. Often times, I combine field labs with show labs giving you a beautiful example of what a retriever should be-- hard working and good looking with a beautiful temperament to match! I breed to the best studs from all over the world from coast to coast with excellent lineage/pedigrees whether it be Show/Conformation Champions, Therapy Dogs, Field Champions, Masters Hunters, Hunting Retriever Champions, etc. So when looking for your next hunting partner/family companion, look no further! All puppies come micro chipped and with a lifetime genetic health guarantee. We are located in Enid, Mississippi and can ship anywhere. Beautiful 4 year old chocolate girl available. She is an extremely sweet girl who is house trained, crate trained and naturally very obedient. She has hip, elbow, eye and heart clearances and has several genetic clearances as well as being microchipped. Would consider an approved breeding home.\r\n\r\nEnidLabradors.wixsite.com/EnidLabradors\r\n\r\nHealth Clearances:\r\n***OFA HIPS (GOOD)\r\n***OFA ELBOWS (NORMAL)\r\n***OFA EYES (NORMAL)\r\n***OFA CARDIAC (NORMAL)\r\n*EIC (CLEAR)\r\n*CNM (CLEAR)\r\n*PRA (NON-AFFECTED CARRIER)\r\n*HPNK/DRY NOSE (CLEAR)\r\n*RD/OSD (CLEAR)\r\n*SKELETAL DYSPLASIA 2 (CLEAR)\r\n*CYSTINURIA (CLEAR)\r\n*PK DEFICIENCE (CLEAR)\r\n*CANINE HYPERURICOSURIA (CLEAR)\r\n*MYOTUBULAR MYOPATHY X-LINKED (CLEAR)\r\n*NARCOLEPSY (CLEAR)\r\n*ELLIPTOCYTOSIS (CLEAR)\r\n*FOLLICULAR DYSPLASIA (CLEAR)\r\n*LONG HAIR GENE (CLEAR)\r\n***K (CLEAR/DOMINANT KK)\r\n***DILUTE (CLEAR)\r\n***COAT COLOR (bbEEDD)--- Dominant Chocolate (no hidden colors)\r\n\r\nPedigree: https://huntinglabpedigree.com/extpedigree.asp?id=100640\r\n\r\n$1500 AKC Full Registration \r\n*To Approved Home Only*\r\n\r\n1-662-654-6992 or cmstrongolemiss@gmail.com\r\n\r\nLocated in Enid, MS.
Puppies come with the following:\r\n*Wormed at 2,4,6, and 8 weeks\r\n*First Shots Veterinarian Given\r\n*AKC Limited Registration\r\n*Microchipped\r\n*26 Month Hip/Elbow/Eye Guarantee\r\n*Lifetime Genetic Health Guarantee(if your pup ever suffers from any of the diseases below, which they definitely will not, a refund will be given)\r\n*Lifetime Breeder Support\r\n\r\nWebsite: EnidLabradors.wixsite.com/EnidLabradors\r\n\r\nHey everyone. I have a beautiful litter due in May. Puppies should mature to be very stocky with nice double, light coats and beautiful otter tails. Both parents are show type labs.\r\n\r\nThe sire to this litter is Dexter Morgan II.. \'Dexter\'. Dexter is a huge male weighing approximately 105 LBS. He has a massive blocky head and is extremely calm and sweet! This is a big gorgeous male with a nice pedigree! He has the following clearances:\r\n***OFA Hips (Good)\r\n***OFA Elbows (Normal)\r\n*EIC (CLEAR)\r\n*CNM (CLEAR)\r\n*PRA (CLEAR)\r\n**COAT COLOR: eeBB (Yellow.. Does Not Carry Chocolate)\r\n\r\nThe dam to the litter is Enid\'s Painted Blond Beauty. Blondie is an absolutely gorgeous girl. She is very thick with a beautiful otter tail. She has a beautiful, soft, and wavy double coat. Blondie has a lot of Mtn Meadow (including Mtn Meadow Ivory Belle, CH Ptd Mtn Meadow Navigator, and CH Ptd Champagne Pearl) in her pedigree and CH Dickendall Arnold farther back. She truly is a gorgeous girl!! Blondie has the following clearances:\r\n***OFA Hips (Fair)\r\n***OFA Elbows (Normal)\r\n***OFA Eyes (Normal)\r\n***OFA Cardiac (Normal)\r\n*EIC (CLEAR)\r\n*CNM (CLEAR)\r\n*PRA (CLEAR)\r\n*HPNK/DRY NOSE (CLEAR)\r\n*CANINE HYPERURICOSURIA (CLEAR)\r\n*CYSTINURIA (CLEAR)\r\n*MYOTUBULAR MYOPATHY X-LINKED (CLEAR)\r\n*NARCOLEPSY (CLEAR)\r\n*PK DEFICIENCY (CLEAR)\r\n*RETINAL DYSPLASIA (CLEAR)\r\n*SKELETAL DYSPLASIA 2 (CLEAR)\r\n*ELLIPTOCYTOSIS (CLEAR)\r\n*LONG HAIR GENE (CLEAR)\r\n*FOLLICULAR DYSPLASIA (CLEAR)\r\n**COAT COLOR: eeBB (Yellow-- Does not carry chocolate. )\r\n**DILUTE (CLEAR)\r\n\r\n5 generation pedigree of litter: https://www.huntinglabpedigree.com/extpedigree.asp?id=128141\r\n\r\nPuppies are $1500 ($500 deposit) Limited Registration. 26 month hip/elbow/eye guarantee and microchipped.\r\n\r\n** Accepting 4 male and 4 female deposits now**\r\n\r\n1-662-654-6992 or cmstrongolemiss@gmail.com\r\n\r\nLocated in Enid, MS.
CH Eagertrieve Magic Mike x Enid\'s Brown Belle From The Bayou\r\n\r\nEnidLabradors.wixsite.com/EnidLabradors\r\n\r\n11 Month Old Chocolate Male\r\n\r\nI have a gorgeous chocolate male (born 5/6/18) available. His sire is CH Eagertrieve Magic Mike. He is a 91 LB conformation type male who has achieved his AKC Show Champion title. His mother is Enid\'s Brown Belle From The Bayou. She is a 55 LB field type female. Very sweet male and a nice retriever.\r\n\r\nCH Mikey\'s clearances:\r\n***OFA HIPS (GOOD)\r\n***OFA ELBOWS (NORMAL)\r\n***OFA EYES (NORMAL)\r\n***OFA CARDIAC (NORMAL)\r\n***TEETH (FULL DENTENTION)\r\n*EIC (CLEAR)\r\n*CNM (CLEAR)\r\n*PRA (CLEAR)\r\n*HPNK/DRY NOSE (NON-AFFECTED CARRIER)\r\n***DILUTE (CLEAR)\r\n***COAT COLOR (bbEEDD)--- Dominant Chocolate (no hidden colors)\r\n\r\nBelle\'s clearances:\r\n***OFA HIPS (GOOD)\r\n***OFA ELBOWS (NORMAL)\r\n***OFA EYES (NORMAL)\r\n***OFA CARDIAC (NORMAL)\r\n*EIC (CLEAR)\r\n*CNM (CLEAR)\r\n*PRA (NON-AFFECTED CARRIER)\r\n*HPNK/DRY NOSE (CLEAR)\r\n*RD/OSD (CLEAR)\r\n*SKELETAL DYSPLASIA 2 (CLEAR)\r\n*CYSTINURIA (CLEAR)\r\n*PK DEFICIENCE (CLEAR)\r\n*CANINE HYPERURICOSURIA (CLEAR)\r\n*MYOTUBULAR MYOPATHY X-LINKED (CLEAR)\r\n*NARCOLEPSY (CLEAR)\r\n*ELLIPTOCYTOSIS (CLEAR)\r\n*FOLLICULAR DYSPLASIA (CLEAR)\r\n*LONG HAIR GENE (CLEAR)\r\n***K (CLEAR/DOMINANT KK)\r\n***DILUTE (CLEAR)\r\n***COAT COLOR (bbEEDD)--- Dominant Chocolate (no hidden colors)\r\n\r\nPedigree: https://huntinglabpedigree.com/extpedigree.asp?id=121586\r\n\r\n$650 AKC Limited Registration\r\n\r\n26 month hip/elbow/eye gaurantee\r\n\r\n1-662-654-6992 or cmstrongolemiss@gmail.com\r\n\r\nLocated in Enid, MS. Adult Yellow Labrador Retriever\r\n\r\nEnidLabradors.wixsite.com/EnidLabradors\r\n\r\nI have an absolutely gorgeous yellow female available to a pet/non-breeding home. Bailey just recently turned 4 years old, so she\'s in her prime!! She is extremely sweet and is house trained, crate trained, and naturally extremely obedient. She has a very strong retrieving drive!! So when it\'s time to retrieve, she transforms into a different dog. This is not a hyper dog at all. She has a great off-switch-- meaning she easily turns the switch off when retrieving is done. She would make an excellent family companion or a hell of a hunting dog.. very versatile dog!! Bailey is health tested, and her clearances are listed below.\r\n\r\n**OFA Hips (Good)\r\n**OFA Elbows (Normal)\r\n**OFA Eyes (Normal w/Breeder Option)\r\n*EIC (CLEAR)\r\n*CNM (CLEAR)\r\n*PRA (CLEAR)\r\n*RD/OSD (CLEAR)\r\n*HPNK (CLEAR)\r\n*NARCOLEPSY (CLEAR)\r\n*PK DEFICIENCY (CLEAR)\r\n\r\n$1000 AKC Limited Registration\r\n\r\n1-662-654-6992 or cmstrongolemiss@gmail.com\r\n\r\nLocated in Enid, MS.